You'd think it would have been very big news in the spring of 2005 when Donald Tashkin, a professor of pulmonology at UCLA, revealed that cannabis smoke doesn't cause lung cancer and may prevent respiratory tissue cells from becoming malignant. You’d think it would have been very big news in the spring of 2005 when Donald Tashkin, a professor of pulmonology at UCLA’s David Geffen School of Medicine, revealed at a conference that components of marijuana smoke, although they damage cells in respiratory tissue, somehow prevent them from becoming malignant. But headlines announcing “Pot Doesn’t Cause Cancer” did not ensue. Tashkin has special credibility. He was the lead investigator on studies dating back to the 1970s that identified the compounds in marijuana smoke that are toxic. It was Tashkin who published photomicrographs showing that marijuana smoke damages cells lining the upper airways. It was the Tashkin lab reporting that benzpyrene—a component of tobacco smoke that plays a role in most lung cancers—is especially prevalent in marijuana smoke. It was Tashkin’s data documenting that marijuana smokers are more likely than non-smokers to cough, wheeze and produce sputum. The National Institute on Drug Abuse supported Tashkin’s marijuana-related research over the decades and gave him a grant to conduct a large, population-based, case-controlled study that would prove definitively that heavy, long-term marijuana use increases the risk of lung and upper-airways cancers. What Tashkin and his colleagues found, however, disproved their hypothesis. Tashkin’s team interviewed 1,212 cancer patients from the Los Angeles County Cancer Surveillance program, matched for age, gender, and neighborhood with 1,040 cancer-free controls. Marijuana use was measured in “joint years” (number of years smoked times number of joints per day). It turned out that increased marijuana use did not result in higher rates of lung and pharyngeal cancer (whereas tobacco smokers were at greater risk the more they smoked). Tobacco smokers who also smoked marijuana were at slightly lower risk of getting lung cancer than tobacco-only smokers. The Tashkin scoop was still there for the taking in April 2009 when Tashkin reviewed his findings at a conference at Asilomar organized by “Patients Out of Time.” Investigators from New Zealand had recently gotten widespread media attention for a study contradicting Tashkin’s results. 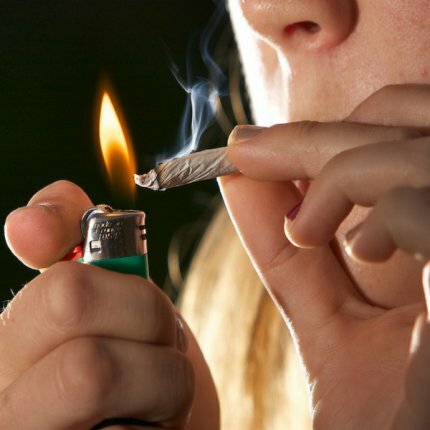 “Heavy cannabis users may be at greater risk of chronic lung disease—including cancer—compared to tobacco smokers,” is how BBC News summed up the New Zealanders’ findings. The very small size of the study—79 smokers took part, 21 of whom smoked cannabis only—was not held against the authors. As conveyed in the corporate media, the New Zealand study represented the latest word on this important subject. Those are strong words for a UCLA School of Medicine professor. As to the highly promising implication of his own study—that something in marijuana stops damaged cells from becoming malignant—Tashkin noted that an anti-proliferative effect of THC has been observed in cell-culture systems and animal models of brain, breast, prostate, and lung cancer. THC has been shown to promote known apoptosis (damaged cells die instead of reproducing) and to counter angiogenesis (the process by which blood vessels are formed—a requirement of tumor growth). Other antioxidants in cannabis may also be involved in countering malignancy, Tashkin said. Much of Tashkin’s talk at Asilomar was devoted to chronic obstructive pulmonary disease, another condition prevalent among tobacco smokers. Chronic bronchitis and emphysema are two forms of COPD, which is the fourth leading cause of death in the United States. Air pollution and tobacco smoke are known culprits. Inhaled pathogens cause an inflammatory response, resulting in diminished lung function. COPD patients have increasing difficulty clearing the airways as they get older. The media has never taken note of the reality that there is a spectrum of expertise among doctors who approve marijuana use by patients. They have portrayed “potdocs” as quick-buck artists practicing sub-standard medicine, ignoring the serious, research-minded clinicians who understand why compounds in the plant alleviate a wide range of symptoms. UC San Diego psychiatrist Igor Grant, director of the Center for Medicinal Cannabis Research, recently published a paper in the Open Neurology Journal concluding “it is not accurate that cannabis has no medical value, or that information on safety is lacking, and calling for its rescheduling by the federal government. The CME course was organized by the Canadian Consortium for the Investigation of the Cannabinoids with support from the Society of Cannabis Clinicians, a California-based group. It provides 2.75 AMA PRA Category 1 Credit(s)(tm).